When Pete Buttigieg joined the presidential race, he was the relatively obscure young mayor of South Bend, Indiana. But a few savvy observers noticed that his father, a retired literary critic, was quite well-known. In fact, Joseph A. Buttigieg was internationally renowned for his authoritative translations of Antonio Gramsci, Italy’s most enduring Marxist intellectual. Joseph Buttigieg spent nearly four decades as a professor at the University of Notre Dame (disclosure: I teach there as well) and produced the definitive English edition of Gramsci’s Prison Notebooks, which Columbia University Press published in three volumes in the 1990s and 2000s. This bit of Buttigieg trivia led some people on the left to wonder what it might say about the seemingly square, relatively centrist Mayor Pete. It’s tempting to seek out a simple (albeit counterintuitive) red thread connecting father and son. Yet the truth about Joe Buttigieg, and about Mayor Pete, is more complex, and more illuminating, than first meets the eye. Pete Buttigieg doesn’t talk much about his father’s scholarship or politics in his new memoir, Shortest Way Home: One Mayor’s Challenge and a Model for America’s Future. He briefly refers to Joe—who died on January 27 at the age of 71, having lived just long enough to see his only child announce a possible presidential run—as “a man of the left.” He mentions overhearing his parents’ dinner-party conversations about Marxist historian Eric Hobsbawm. In Shortest Way Home, Joe comes across not as a tenured radical but as a brilliant and caring father who received his son’s coming-out with equanimity, kept a Creedence Clearwater Revival cassette on years-long repeat in his Chevy Cavalier, and made sure Pete knew what a big deal it was to be studying at Harvard with the famed literary scholar Sacvan Bercovitch. The part of Joe’s work that gives the greatest insight into Pete, it turns out, has far less to do with who Joe studied and more to do with how he studied him. In the days following Joe’s death, I called some colleagues to learn what insights his scholarship and politics might yield about Pete. Unsurprisingly, they described Joe as very, very smart: “one of the smartest persons I ever met in my life,” as his longtime colleague Chris Fox put it. 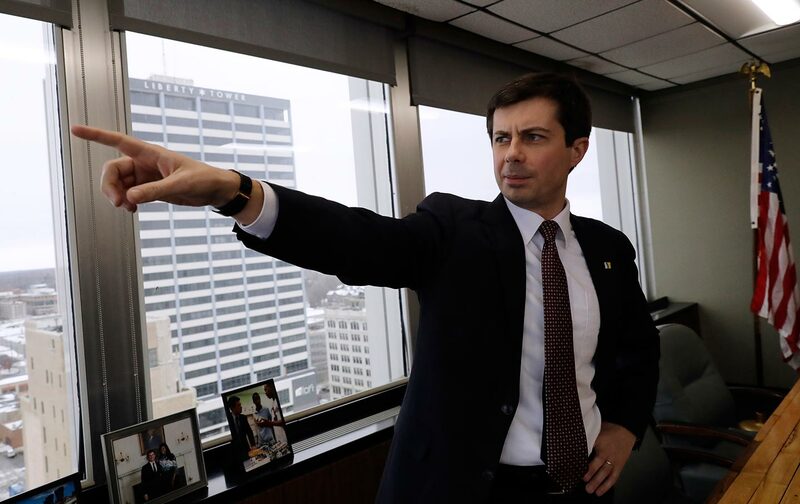 If Joe Buttigieg didn’t hew to a rigid political line, he was exacting in other ways that his colleagues believe could have shaped Pete’s thinking. “I’m not surprised that Pete would become somebody with such big ambitions,” Huk said. “As an educator, and probably as a father, Joe always had that expectation” that the people he mentored would go on to great things—if they put in the work. Some elements of his father’s Gramsci scholarship do present enticing points of connection with Pete’s project. Gramsci did most of his work during a time of brutal defeat for the left; writing from a prison cell in Fascist Italy, he was trying to figure out how the left had lost so much ground, and what it could do while out of power to prepare for a comeback. The answer, he concluded, had a lot to do with culture—religion, civil society, literature, and intellectual work. Mayor Pete, for his part, clearly understands the importance of culture. But he deploys it for civic, not partisan, ends. He commissioned a massive interactive light sculpture that has turned the city’s waterfront into a multicolor wonderland; he slowed down car traffic through central South Bend so people and bikes could come downtown; and, with great fanfare, he renovated or razed over 1,000 abandoned houses in as many days during his first term as mayor. When he told The Washington Post last fall that “a good organizer knows about building a social culture in a campaign,” he was talking about team-building activities, not propaganda. His stated campaign themes of freedom, democracy, and security are likewise about building consensus, at a moment when many party faithful, of both parties, are more excited about sharpening contrasts than downplaying them. His ecumenical approach is part of what leads some leftists to dismiss Pete as neoliberal or centrist or boring. But while his campaign has so far been about extremely big ideas, as South Bend’s mayor he has focused on much smaller things—trash trucks and snow plows, fiber optics and bike shares. And at the intersection of these two scales—the impossibly broad and the minutely specific—we can start to see what makes Pete Buttigieg a politician worth watching. It’s this philological commitment to textual detail and completism, along with an understanding of historical and political context, that offers the most important insight into Pete Buttigieg, the Midwestern mayor who wants to be our first gay, millennial president. His biography is straightforward enough: a South Bend boyhood, a history-and-literature major at Harvard, a Rhodes scholarship, a stint as a consultant at McKinsey, work on several political campaigns, military service as a Navy Reserve officer (including a deployment to Afghanistan), and, most recently, two spectacularly successful terms as mayor of South Bend—including winning reelection by a landslide after coming out as gay in the South Bend Tribune. Harder to parse are the mixed signals he sends out, which leave some constituents wondering whether he is just a “McKinsey-slick” technocrat, as n+1 sniffingly dubbed him last year, albeit in modestly left-of-center garb. He calls himself a progressive and gave a speech at South Bend’s modest Women’s March in January 2017, but he sometimes comes off as a detail-oriented technocrat, claiming that we can transcend ideological battles through a pragmatic dedication to data and making things work. He loves touting the WiFi-enabled “Smart Sewers” that control runoff, as well as the old Studebaker plant he helped transform into a tech incubator. While this is a great way to run a small city—and many of his initiatives have made South Bend a better place to live—riled-up Democratic primary voters won’t necessarily rally behind a data-loving wonk. Joe Buttigieg knew, though, that even the most inspiring progressive ideas weren’t worth much unless you also paid attention to the details. When he started working on Gramsci, the Italian thinker was a common touchstone for political discussions—but almost none of Gramsci’s English-speaking devotees had read the Prison Notebooks in full, let alone were familiar with the full breadth of his work. The critic must have seen an important opening here: What were Gramsci’s most passionate adherents failing to see? A dedication to philology, a responsibility to what is actually in the books, lives at the core of Joe Buttigieg’s work. And if he passed this along to his son, then Pete Buttigieg’s politics might start to look less like dry technocracy and more like a sort of ethics: a principled care for lived experience in all its dull complexity, and a commitment to talking about it in ways that people will listen to. In 2019, when the US president seems incapable of reading a full paragraph of text and a right-wing Senate passes 2,000-page spending bills no one has perused, this might just be the moment for someone who cares about just that: reading the whole thing. Gramsci—who wrote that human nature “is a historical fact which can be ascertained, within certain limits, by the methods of philology and criticism”—would probably approve. And Joe Buttigieg certainly would as well.